Reaction calorimetry provides an understanding of a chemical process and is an important source of safety and scale-up information. Reaction calorimeters determine how chemical reactions can be safely transferred from the lab to manufacturing and identify issues related to heat and mass transfer or mixing. The Guide to Reaction Calorimetry discusses how scientists and chemical engineers obtain scale-up, process safety screening and process safety information enabling them to create robust processes and ensure products are manufactured safely. 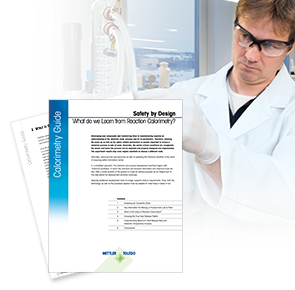 This Guide shows the value of implementing reaction calorimetry into processes as well as how to optimize process safety investigations.